Technology has made a real impact on our lives, especially in the kitchen. ‘Smart’ innovations, like kitchen appliances that use your mobile phone to ‘talk’ to each other, are just one way technology is making it easier to cook.Here at Cucina we’re focused on the basic kitchen IT innovations. 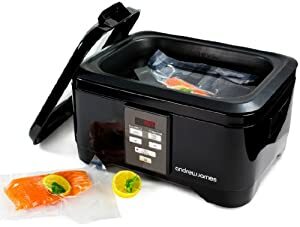 There are a growing number of kitchen tools, appliances and gadgets the can help anyone from the amateur cook at home to a chef in a restaurant, prepare meals quickly and efficiently without losing quality. This is important considering the fast-paced lifestyles most people live. While we all want good food, no one wants to spend all of their time in the kitchen. There are a number of popular technology-related kitchen tools on the market and we believe some of them could go mainstream in 2014. We can’t predict the future but if they don’t do well, we feel this is a lost opportunity. With cooking, timing is everything. The touch screen oven from Gorenje helps you manage time. This impressive looking appliance can not only tell you when to add the next ingredient, it can also calculate how long it would take for you to ruin the food (no more overcooked meat). The oven comes pre-programmed with 65 meals and you can add another 150. You no longer need to have multiple timers or a perfect memory. This silver and black appliance will fit well in most kitchens and may quickly become your favorite ‘kitchen assistant’. Water ovens (yes, I said water) are a new way to cook meat. No matter what type of meat you put into the oven (via a bag) it is guaranteed to come out tender. This is a simple cooking technique that produces great food with very little effort on your part. The secret to great baking is measuring, but not with a measuring cup or spoon. The secret is a good scale. This IT scale makes measuring easier. It has an instant read out in cups, millilitres, tablespoons, teaspoons, etc., and they all display at the same time. This makes it easier to use when measuring different types of ingredients. While this is not IT related, we felt that this is a kitchen item people need to have. There is a standard shape for mugs, the one we’re used to seeing. This porcelain mug is different. It has a bit of a corner. This can serve as a spout or a place to rest your spoon. This makes the cup easier to hold which eliminates the need for a handle. And if that’s not enough to send you running to the store to buy one, they’re also stackable, even when there’s a teaspoon in the mug. For most people mornings are hectic. 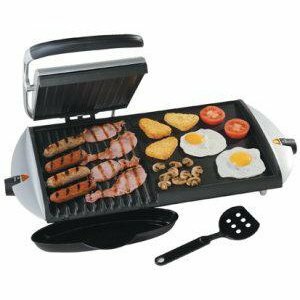 Imagine being able to cook your eggs, toast your muffin and melt cheese, then have it assembled into a sandwich in a few minutes. That’s what this hot sandwich maker does, and it does it all while you sit down to read the morning paper. 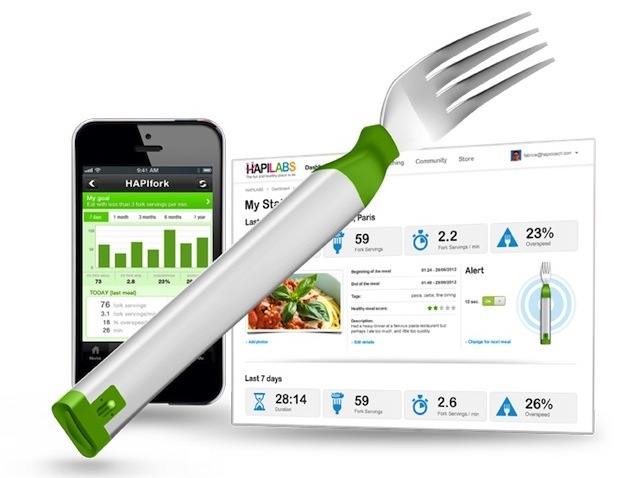 The HAPIFork is a gadget we mentioned last year. This smart phone activated tool monitors how much food you consume, how fast you eat and how much time passes between each mouthful of food. This is an impressive gadget, which is why we’re mentioning it again. It helps people learn how to be more conscious of what they eat. It’s easy to not notice how quickly you eat. This tool not only helps you see if you are a quick eater, it can help you monitor your progress as you learn how to eat slowly and chew more on each mouthful. Doing this can help you lose weight.